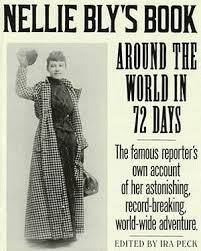 “It’s the best of journalism meets The Amazing Race meets Around the World in Eighty Days. Phineas Fogg, move aside. One of the most daring stories in history is that of investigative journalist Elizabeth Jane Cochrane (aka Nellie Bly) who in 1889 decided she would try to beat the fictional record in Jules Verne’s now classic story and go around the world less than 80 days. At the same time, because competition is the name of the game in journalism, Cosmopolitan sent their own reporter Elizabeth Bisland, out to beat not only the 80-day fictional Phineas Fogg record but also try to one-up Bly who was working for Joseph Pulitzer’s New York Worldnewspaper.